I've been so bad about posting this month, but things have been really crazy. Hopefully they'll settle down soon (and I'll be able to pass on Brenda's incredibly sweet gesture from today! ), but in the meantime, just another bit of poetry promotion. I'm hosting a reading tomorrow evening at work. If you're around NYC, you should really come, because this is a seriously great group of readers. Below, you'll find some information, and to RSVP, click here. 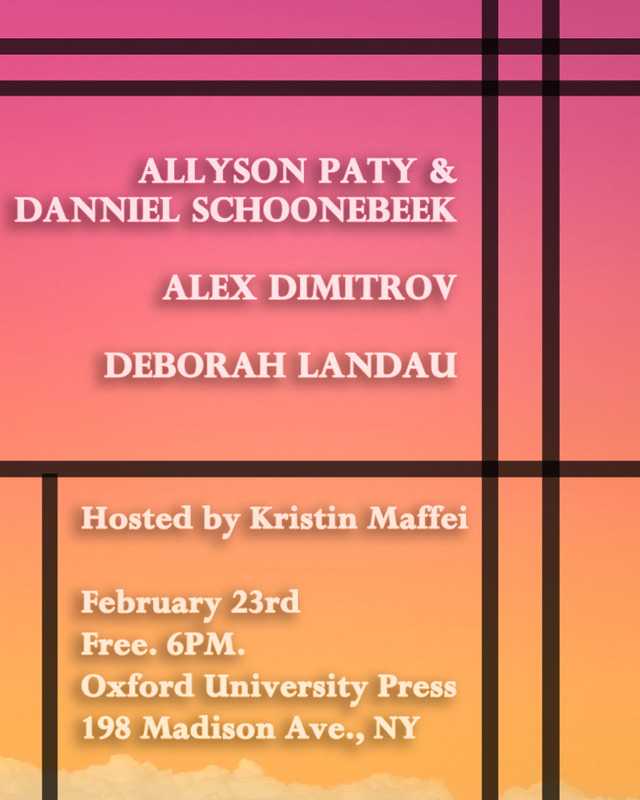 On February 23rd, Oxford University Press in New York will host four poets reading together on one night. Their poems span a broad range of forms and aesthetics, from collaborative short poems and plainspoken lyrics to a sequence of post-apocalyptic epistles. A wine reception will begin the evening at 6 p.m., with readings from the poets afterward. 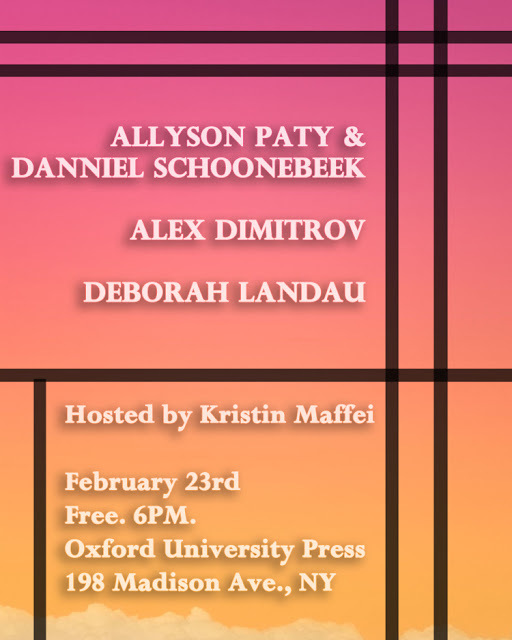 Oxford University Press associate editor Kristin Maffei will host the event and read a selection from her own poems. If you are a poetry fan/lover please join us. To wet your appetite for the event, we have a few selections of poetry below. Allyson Paty is the author of the chapbook The Further Away. Her poems have appeared or are forthcoming in Tin House, DIAGRAM, Boxcar Poetry Review, The Awl, Colorado Review, and InDigest, among other publications. Danniel Schoonebeek’s work has appeared or is forthcoming in in Tin House, Boston Review, Crazyhorse, The Kenyon Review, La Petite Zine, Gulf Coast, The Collagist, and elsewhere. He curates the Hatchet Job reading series at Public Assembly in Brooklyn, NY. Alex Dimitrov’s first book of poems, Begging for It, is forthcoming from Four Way Books in early 2013. He is the recipient of the Stanley Kunitz Prize for younger poets from The American Poetry Review and the founder of Wilde Boys, a queer poetry salon in New York City. His poems have appeared or are forthcoming in The Kenyon Review, Yale Review, Slate, Tin House, and Boston Review. Deborah Landau is the author of Orchidelirium, which won the Anhinga Prize for Poetry, and The Last Usable Hour. Her poems have appeared recently in The Paris Review, Tin House, The Kenyon Review, and TriQuarterly. She directs the creative writing program at NYU. Kristin Maffei is an associate editor at Oxford University Press. A graduate of Sarah Lawrence College and an MFA student at NYU, she is also co-founder of the collaborative ‘zine Call & Response. Her work has been featured in The Little Jackie Paper, Quarrsiluni, and In Flux, and she once wrote a book on horses. For a sampling of the readings, check out the OUPblog on the event.